Going to Africa on a volunteer trip had always been something that I dreamt of since I was a little kid. For whatever reason, I always knew it was something I was going to do. I first started speaking with the Beauty for Freedom just over a year ago about being involved…I never imagined that I would be lucky enough to embark on a trip with them, let alone one that revolves around my three biggest passions; making people smile, living in the moment and the arts. All of which fit perfectly with the Beauty for Freedom mission. 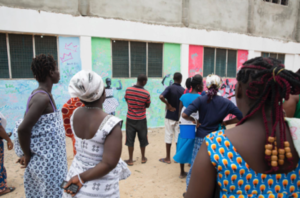 When I was picked to lead the Mural Workshop for Project Ghana, I had no idea of what to expect or how big of an affect the trip would continue to have on my life. When planning the workshop, I knew I wanted to convey these passions with the children of Challenging Heights, in hopes of inspiring and motivating the students to dream big. 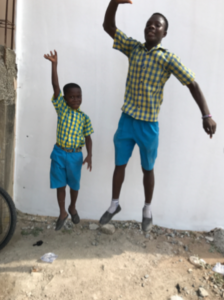 The idea was to wheat paste pictures of the students, “jumping” to reach new heights, and then have them fill in the walls with their dreams. Prior to asking the students what their dreams were and what they wanted for the future, I was expecting typical grade school answers that evolved around themselves, such as, being a professional soccer player or performer. As we started to paint though, I quickly realized a larger theme. The students were working together and depicting dreams of a better community and Ghana as a whole. Even with such a troubled, traumatized past so recent, they still saw a bigger picture and looked past their own hardships in hopes of a brighter future for all. The students wanted everybody to be better and for their country to progress together. There were lots of symbolism of country pride as well as plenty of words of encouragement. 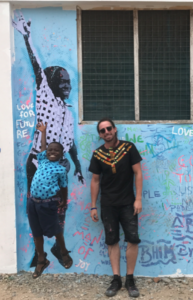 Some of the main, recurring wording that stood out the most was Love, Peace, Education, Joy, and support that “We Should Be One People.” Many of these keywords go to show the childrens’ selflessness and how themselves and community are pure at heart. Being able to create with the students throughout the day and then spend the last two hours touching up the mural in the rain, reflecting on the students’ dreams and what they wanted for their future ended up being one of the most powerful moments I have experienced. 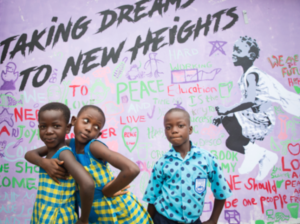 Upon completing the murals, we had the opportunity to unveil our concept of “Taking Dreams to New Heights” to both the students’ parents, as well as, Lawyer Francis-Xavier Sosu, a Human Rights Ambassador for Ghana to the United Nations and President of the Youth For Human Rights Africa. Looking back on our trip, I can honestly say that this was one of the best times of my life and the interaction with the students will remain with me forever. 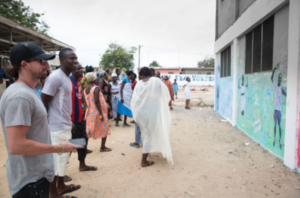 One of Beauty for Freedom’s most unique beliefs is continuing to provide assets to the foundations we support and I am excited where Project Ghana is continuing to go. We have since met with Lawyer Francis-Xavier Sosu again in New York City to see where we can collaborate and continue to support the children of Ghana. 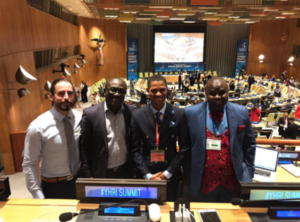 This past week I was able to watch Francis-Xavier Sosu speak at the Youth for Human Rights International Convention, held at the United Nations Headquarters, where he spoke about his life story and the current state of human rights throughout Africa. While there, I was able to meet various human rights influencers from across the world, as well as, individuals directly involved with the Ghanaian government. 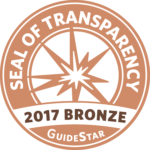 Their support was great reassurance of our projects work and we are all looking forward to a better future for Ghana and a world without human trafficking. 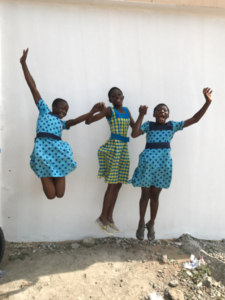 Please Visit www.challengingheights.org to learn more about their amazing movement in the eradication of child labor trafficking here in Ghana.